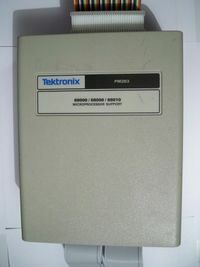 The PM 203 personality module is a disassembly probe for the Motorola MC68008, Motorola MC68010 and Motorola MC68000. It is meant to be used with the 91A24, 1240 and 1241 logic analyzer. See the Microprocessor support table for configuration details. The PM203 does not use EPROMs, it uses two N82S191F and one 82S181 PROMs.